He will be performing at the Super Bowl Halftime Show with his band Maroon 5. And Adam Levine made sure to spend some quality one-on-one time with one of the most important people in his life before the huge gig. 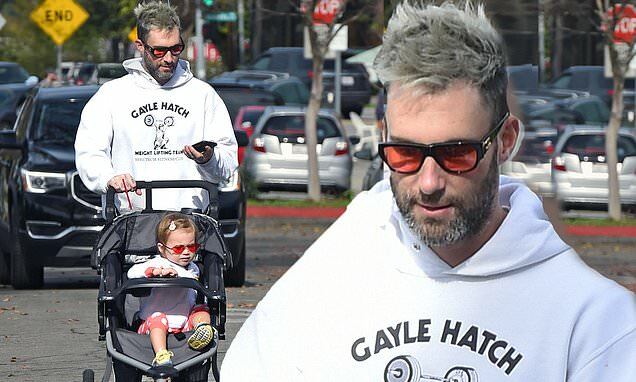 The 39-year-old rock legend was spotted out with two-year-old daughter Dusty Rose on a bonding outing in Los Angeles on Sunday. Adam was not too posh to push as he moved along the stroller containing his bundle of joy. He kept it casual with a white Gayle Hatch weightlifting hoodie with black track pants and red and white Off-White X Nike Air Jordan 1 high-top sneakers. This comes just days after his wife and Dusty's mother Behati Prinsloo candidly opened up about her postpartum depression after giving birth for the first time and also gushed about the Maroon 5 frontman. In the interview with NET-A-PORTER’s digital magazine, PorterEdit, the Namibian model, 30, admitted that she has been happier than ever with Adam ever since they exchanged vows at the picturesque Flora Farms in Mexico in front of a 300 strong guest list including Robert Downey Jnr, Jason Segal and Jonah Hill. And reflecting on the beginning of her relationship with the Maroon 5 frontman, the catwalk queen admitted she first shared a 'natural correspondence' with him over email.